Ab Exercises to Lose Belly Fat? Is that really enough? Ab Exercises to Lose Belly Fat? I know that many people search for the best ab exercises to lose belly fat, but the truth is that even the best ab exercises by themselves are not enough to help you get rid of stubborn belly fat. I sat down with my friend and Personal Trainer Daihyana in order to find out some of her favorite ab exercises and to also learn what she teaches her clients to help them lose belly fat fast. Below are some of Diana's favorite ab exercises. Starting Position: Begin by lying on your back with your arms stretched over head and 1 leg straight. Form: Exhale and as you bring your leg to 90 degrees crunch forward with your upper body in an attempt to touch your toes. Hold briefly at the top and slowly lower to the starting position. Personal Trainer Tips: Repeat for 8-15 repetitions on each leg. Starting Position: Begin by lying on your side with your bottom arm positioned for support. Form: Exhale and bend your body so that your knees move towards your shoulders. Hold briefly at the top and then slowly return to the starting position. Personal Trainer Tips: This is a challenging ab exercise to master. You can also begin from the seated position and lower yourself down on an angle, instead of starting from the floor. Starting Position: Begin by lying on your back with your arms stretched out to the sides. Form: Exhale and sit up reaching your left hand to your right foot. Hold briefly and lower back to the starting position. Repeat on the other side. Perform 8-15 repetitions on each side. 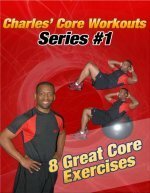 Personal Trainer Tips: This is another challenging ab exercise. If places some pressure on the lower back because of the full sit up motion and movement in the legs, so it is not recommended for someone with a back injury. There are some of the favorite ab exercises from Personal Trainer Daihyana V.
If you like them, incorporate them into your workout or choose other exercises from The Directory of Abdominal Exercises to construct your own ab workout. Ab Exercises to Lose Belly Fat Are not Enough! Remember, if you only do ab exercises to lose belly fat, you'll never reach your goal because you cannot spot reduce fat from under your skin simply with stomach exercises. In order to lose stomach fat and get a flat stomach you need a comprehensive fitness and diet plan.